Rhodium is a platinum group metal of high value, typically twice the price of platinum and 3 to 4 times the price of gold. It is a hard, white, highly reflective metal and is predominantly used to enhance the whiteness and reflectivity of white gold jewelry. Why Rhodium Plate Engagement Rings? Rhodium plating is a technique often used to plate white gold settings, giving them high reflectivity and so enhancing the "brilliant" appearance of diamond. Rhodium is also chemically inert and will withstand corrosive attack. For this reason, it is often used on 14kt white gold diamond engagement rings to give extra protection during everyday use. Will Rhodium Plated Rings Wear? First, we have to look at the definition of "white gold." Many manufacturers use white gold alloys that contain only small additions of either nickel or palladium as a bleacher, which results in a color that is actually best described as pale yellow. Because the whitening additions are present, the gold alloy is described as "white" when perhaps "straw" would be a better description. To make the setting look more desirable, it is rhodium plated and so has a beautiful white reflective surface. The problem with rhodium plating occurs when the plated diamond engagement rings have been worn over a period of time and undergo wear. Rhodium is usually only plated to a thickness of a micron or so (one micron = 1/1000th of a millimeter). This will be removed over time, exposing the straw color of the original "white" gold alloy underneath. The contrast between the remaining rhodium plate and the original white gold is very noticeable and makes the jewelry look worn and poor. This results in you having to make frequent trips to your jeweler to have your rings re-plated. 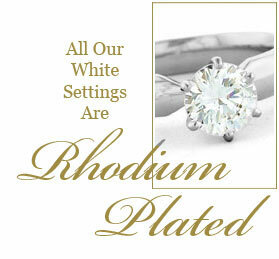 Does Danforth Diamond do Rhodium Plating? At Danforth Diamond, we rhodium plate our settings to give you the optimum color and reflective surface to enhance the diamond in your setting, but here's where we're different and stand out from the crowd. We use a true white alloy to start with and plate this. Because of the minimal contrast between our white gold alloy and the rhodium plating, when wear occurs in highlighted areas and rhodium is removed, it is far less noticeable than with most other white gold jewelry. The base alloy is not as reflective but is a good white color, making wear and tear less noticeable. This greatly increases the time between re-rhodium plating and keeps your diamond engagement ring looking great.